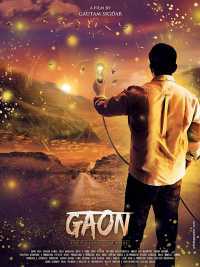 Gaon The Village No More is an upcoming Indian film directed by documentary filmmaker Gautam Singh. The film stars Shadab Kamal, Omkar Das Manikpuri, Shishir Sharma and Neha Mahajan. The film is scheduled to release on October 26, 2018. This film is inspired by director Gautam Singh Sigdar’s own village in Jharkhand, India. The film talks about the way the element of money impacts the society. It attempts to showcase the journey that India has gone through in the last 200 years in a nutshell. Bharat, the village, is self-reliant with everyone contributing towards the well being of the rest of the villagers. Things dramatically transforms when an outsider, called Bharat, enters the village. The village Bharat and the man Bharat represent diametrically opposite interpretations of ideas.